Although commercial handrails are installed mostly for function and safety, the design can be extremely important to your business as well. Upholding your reputation with visiting guests and customers is just as important as safety and function. Since we are a custom fabrication shop, creating a handrail that is DURABLE, suits your needs and coincides with your style is all easily achieved. 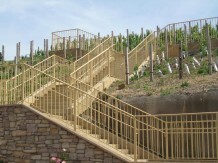 Check out a sample of handrails we have done over the years for our commercial clients. We enjoy collaborating with our clients to create and design custom handrails that are unique and personal. Often our customers will be asked to stop by to approve specific details giving them a feeling of being part of the creative process which they find very satisfying. We enjoy the many challenges involved in fabricating custom steel designs. The ideas we and our clients have come up with over the years have always been a pleasant surprise. Steel is such a versatile and dramatic material to work with! We also use a variety of finishes for these projects from rusted, to sealed bare steel, to primed and painted OR lastly powder-coated for the utmost color longevity. 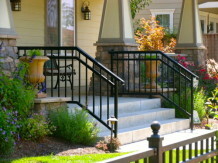 Call today and we can discuss your special railing project and help you to create a beautiful and functional design that will compliment and enhance your home! Whether it’s alongside stairs or around your deck, wood handrails can be decorative just as much as they are functional. From beautiful Redwood to Western Red Cedar, unlike steel that must be fabricated in our shop – we handcraft these wood handrails right there on site. 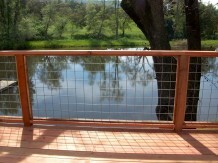 We can add mid-rails, balusters or even wire beneath the handrail to give it that finishing touch. Check out the possibilities.